Crystal--What a great post. Yes, as a writer, you are the keeper of your own passion. Love it! So glad you did this for yourself. 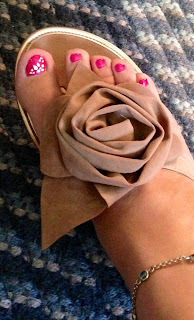 (Cute pedi color too--wondering what polish that is). And yes, I think most of us can relate to everything on your list of concerns. Thanks for an upbeat post to get us re-inspired! Ahhh inspiration to seek renewal and respite. Love it. Thanks for sharing (ooo and pretty toes! ).